Chlorophyllin – What Can It Do For You? Home » Health Alerts » Chlorophyllin – What Can It Do For You? I emphasized in the past that what we eat, how it is cooked, and what we eat out of may be very important in prevention of disease. It is estimated that 90% of cancers are caused by our lifestyle and environmental factors. This then suggests that cancer is a preventable disease and now we know how to neutralize the sea of carcinogens we all live in. Simply said, stop charring and blackening your food, as this produces carcinogens. Stop drinking and eating out of plastics, they are carcinogenic. For all the rest, you can neutralize the carcinogen with chlorophyllin, a compound from chlorophyll, the molecule that make our plants green. The science behind this protective molecule is amazingly abundant and would refer you to the 80 references found in Life Extension’s December 2014 issue on pages 35-42. Carcinogens injure by attaching to our DNA. Chlorophyllin can block their attachment. Chlorophyllin can also block the absorption of carcinogens into our blood stream, and increase the removal of carcinogens from the body. Chlorophyllin can also inhibit the growth of cancer cells by inducing the cancer cell to undergo cell suicide, what we call apoptosis. Chlorophyllin prevents cancer cells from spreading or metastasizing. Chlorophyllin can reduce tumor growth by inhibiting angiogenesis, the process of developing new blood vessels which is necessary for the growth of a tumor or its metastasis. 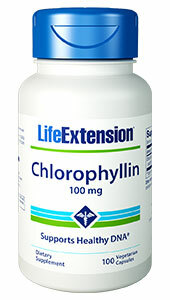 Chlorophyllin protects the body against oxidative damage by neutralizing free radicals that injure DNA and our cells. Many of our patients have low white blood cell counts averaging 3000, a sign of injury to the vulnerable blood cell. Chemotherapy, radiation, toxic chemical exposure, and specific cancers are major causes. Treatment of those patients with chlorophyllin corrected 85% of those with this injury. An ounce of prevention is worth a pound of cure. Pay attention to the charring of your food and eating and drinking out of plastic. Add chlorophyllin to your daily regimen, taking one 100 mg capsule with your meals, but especially when eating foods broiled or heated at high temperature. Life is precious. I am so tired of seeing so many wonderful people getting sick and dying from cancer – now the #1 cause of death in America. I am now adding Chlorophyllin as a MUST TAKE nutrient, as well as Vitamin D3, Tocotrienol (Vitamin E Isomer), and Vitamin K2 as MK7, all fat soluble vitamins, to keep us healthy. To order a supply of chlorophyllin, or any of the other nutrients from COEM, send an e-mail to ORDERS@COEM.COM with the following information.